All M2M amplifiers and repeaters listed below are compatible with your Bell service. Bell M2M Signal Boosters for use in ATMs, lotto & vending machines, remote monitoring systems, etc. Like all major carriers, Bell has the similar network infrastructure powering phones, internet and machine to machine wireless or cellular connections. They claim and it does seem that it is superior to other Carrier networks providing larger area of coverage and better coverage penetration. However, a plethora of computing machines are buried deep inside concrete office buildings and urban malls with vast ceilings. Such machines rely on Bell network to perform machine to machine applications. Depending on their location and the function, the machines can work effectively, or they can have glitches owing to the signal strength of the carrier or the location of the machine. While phones and internet connections for personal and commercial purposes cannot suffer much from poor network, causing only intermittent inconveniences, the significance of M2M signal strength is much greater. Such operations will come to a grinding halt should the network fluctuate, or should the signal strength be poor. Even if M2M operations are on, despite poor signals, the operation would be time consuming and thus the function may be rendered inefficient. The only solution to poor signal strength is a Bell signal booster for M2M. The signal boosters for M2M powered by Bell are categorized as Security 4G and Signal (for 3G and 4G). weBoost Security 4G M2M (471119) Machine To Machine Signal Booster For Security Systems works for Bell's 3G and 4G LTE networks. This Bell signal booster for M2M is ideal for security systems, which would include alarms, CCTV networks, entry systems, wireless security and even motion sensors. Any kind of security apparatus that requires an active internet connection or a network, will operate better with this Bell signal booster for M2M. The device facilitates two-way amplification that would make downloads and uploads faster. The network availability will be more reliable so there wouldn't be intermittent fluctuations which could otherwise impair the functioning of the system. The security system itself will be far more reliable with better network access. Since security systems consume more power when they keep searching for better network reception, you could save on power consumption with more consistent network facilitated by this Bell signal booster for M2M. • weBoost Signal 3G (470109) M2M Direct Connect Signal Booster Kit works for 2G and 3G networks. This booster is presently used for vending machines, cash dispensers and an array of devices. The booster can strengthen the signals by up to 15 dB. While that would improve the network reception for the device to function, it would also ensure that the signal strength is stable for the device to keep operating optimally. M2M operations can be impaired without any fault of the device or the network. It is very common for obstructions between the cell tower and the site where the machine is installed to play the culprit. In such cases, a signal booster like Signal 3G can ensure that the amplification overcomes the obstruction and thus the poor network reception. It is common for many boosters to offer a substantial enhancement when the signal is typically strong or substantial. This Bell signal booster for M2M can work even when the network availability is at its weakest. The Signal 3G Bell signal booster for M2M works on Band 5 frequency of 850 MHz up to Band 25 frequency of 1900 MHz. There's a 2 year warranty. • weBoost Signal 3G (470209) Compact M2M Cellular Booster Kit is compatible with 2G and 3G networks. The reliability of this Bell signal booster for M2M has put it to widespread use in ATMs and in the fleet management industry. The most noteworthy feature of this booster is the fact that it can maintain strong signal strength consistently. Many boosters are capable of enhancing the signal strength but that enhancement suffers fluctuations from time to time. That is not the case with this one. You can get a maximum gain of 15 dB with this booster. • weBoost Signal 3G (470309) M2M Booster With Hardwire Kit is widely used in cash dispensers, vending machines and security equipments, among others. Compatible with Bell 3G HSPA network, the booster offers two-way amplification and can improve the signal strength by a maximum of 15 dB. The booster also improves the battery life substantially. • There are many machines that don't work exclusively on 3G or 4G networks. They are compatible with either 3G, or 4G, or 4g LTE, or all. It is much like the smartphones today that are compatible with more than one spectrum. Such machines will require a booster like the weBoost Signal 4G 470119 M2M Signal Booster Kit. It is compatible with 3G HSPA and 4G HSPA+ LTE and LTE Advanced networks. It is capable of enhancing the signal strength by a maximum 15 dB. It offers two-way amplification which facilitates outbound and inbound traffic. It can work just as well in indoor installations and at confined places as it does in outdoor installations. Machines installed outside or where there is little obstruction between the site and the cell tower can operate much more smoothly owing to better network reception. It is the confined places and sites where there's plenty of obstruction that suffer the most. The Signal 4G Bell signal booster for M2M can be a great solution. The device comes with a mini antenna which is magnetically mounted at the window or anywhere strategic that would ensure consistently enhanced signal strengths. 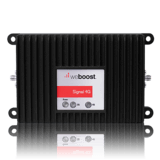 • weBoost Signal 4G (470219) M2M Hardwire Signal Booster Kit is compatible with 4G networks. Owing to its reliability and the consistent improvement of signals by up to 15 dB, this Bell signal booster for M2M is widely used in ATMs, lotto machines and vending machines that require round the clock network availability and a strong signal to operate. While the max gain of signal strength and the coverage may not appear to be a world apart from other signal boosters of its kind, the consistence and the reliability make this device more desirable. Bell Signal Booster for M2M - Summary. M2M operations cannot be standardized. Identical vending machines powered by Bell network can function very differently depending on where they are installed and the kind of coverage Bell has in the given area. Local factors also play an important role. The kind of construction at a site, the obstructions between the site and the cell tower, the kind of traffic that the area is dealing with at a given time, and the specifications of the device or equipment will determine the kind of signal strength you would get in your M2M operation. Thus, you must factor-in all these elements, before deciding on a particular Bell signal booster for M2M. You would obviously choose a booster that is compatible with 3G and 4G, so it works on whichever data network of Bell you use. You should also factor-in whether or not your M2M operations require mobility. Not all signal boosters would offer you the desired impetus when you keep moving the device around. Many boosters will work best when installed at one place so you might want to check out a portable Bell signal booster for M2M if your operation is mobile. Most of these signal boosters come with two year warranty so you don't have to worry about the return on your investment. Other than the location, signal strength available without a booster and the kind of device you use, consider how long you need the signal boost. Don't just judge a Bell signal booster for M2M by its max. gain of signal strength.